The Africa RISING–NAFAKA project has trained more than 250 government extension staff and more than 40 lead farmers from Tanzania’s southern highlands on fall armyworm (FAW) management. The training sessions took place from 22 January–6 February 2018 in the districts of Kilolo, Iringa Rural, Mufindi, Wanging’ombe, Mbozi, Momba, Mbarali, and Kilombero where FAW has been reported. The extension officers and lead farmers learned how to scout for and identify the worm, appropriate control methods such as safe and correct use of pesticides, and cultural practices for managing the pest. This training is part of concerted efforts by the government and stakeholders in Tanzania’s agricultural sector to reduce losses being suffered by maize farmers across the country due to this highly invasive pest. 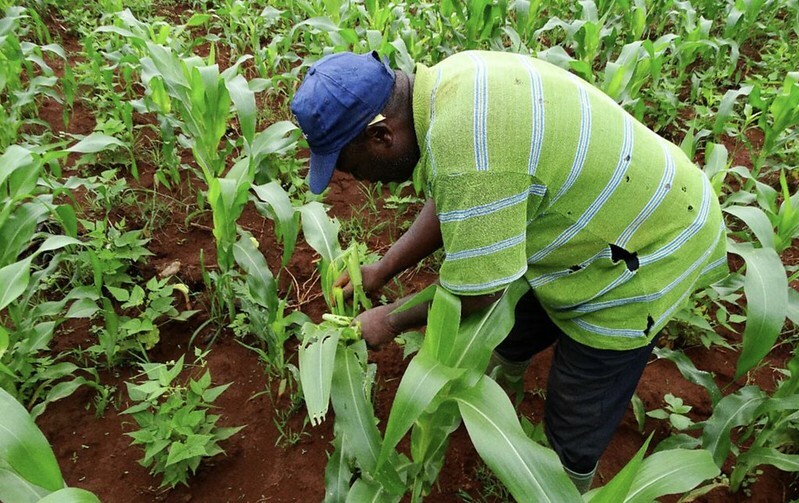 A maize farmer inspecting crops affected by the Fall Army Worm pest. Photo credit: Frednand Japhet/IITA. According to a report published by the Food and Agriculture Organization of the United Nations (FAO) in August 2017, the pest had been reported in 14 regions in Tanzania: Songwe, Katavi, Mbeya, Iringa, Njombe, Ruvuma, Lindi, Mtwara, Morogoro, Rukwa, Arusha, Manyara, Shinyanga, and Kilimanjaro and caused a 3% reduction in maize yields in 2017 below the previous five-year annual average of 5.6 million tons. ‘We expect that each of the trainees (extension staff) will train at least 200 farmers in each village on how to control the fall armyworm, design spraying programs as well as support the spray service providers made up of youth, producer organizations, and village-based agricultural agents who were trained by the project. We agreed that they will report every week to district authorities on the progress,’ explains International Institute of Tropical Agriculture (IITA) technology scaling specialist, Haroon Sseguya. The extension workers welcomed the training, saying it was crucial in their efforts to support farmers in saving their maize. ‘The fall armyworms invaded our village from 2016 and in 2017 they caused a lot of damage. We did not know it was a new pest. We thought it was the maize stalk borer and we applied the same control measures, both traditional and modern, using chemical pesticides, but we were not succeeding in controlling it,’ said Lydia Shonyera, district crops officer from Mbozi District, Songwe Region and one of the trainees. ‘We have benefited a lot from the training; we now have the correct information for the farmers. We only wish that this training had taken place much earlier. We could have saved our harvest. But we will now be able to protect this year’s harvest from the pest,’ she said. This was reiterated by Marcodenis Misungwi, a village extension officer from Nansama village, also in Mbozi District, who said that while the pest was not yet a big problem in his village, the training would enable them to contain it and reduce damage before it was too late. 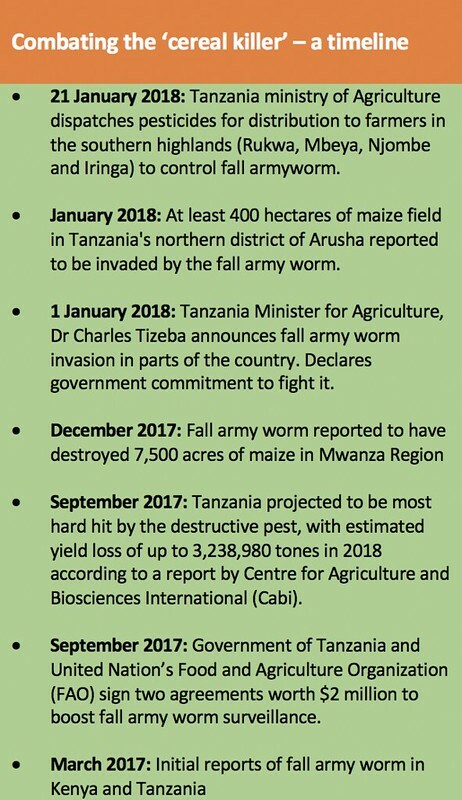 Fall armyworm invasion was first reported in Africa in Nigeria in January 2017, and in both Tanzania and Kenya in March of that year. Since then it has spread rapidly across the continent attacking maize farms with no regard for country borders. These training sessions were supported by the United States Agency for International Development (USAID) Tanzania Mission which funds the Africa RISING–NAFAKA Partnership and Scaling Project. Through this collaborative and synergistic partnership activity, the two projects are promoting and supporting adoption of promising interventions that enhance agricultural productivity in Tanzania. Key interventions include promotion of climate-smart agricultural innovations, dissemination of best-bet crop management packages, rehabilitation and protection of natural resources, and reduction of food waste and spoilage in three crop enterprises—maize, rice, and legumes. Nutrition and postharvest handling are also integrated as cross-cutting themes. Written by Catherine Njuguna, Jonathan Odhong’ and Haroon Sseguya. Tags: nafaka, USAID. Bookmark the permalink.